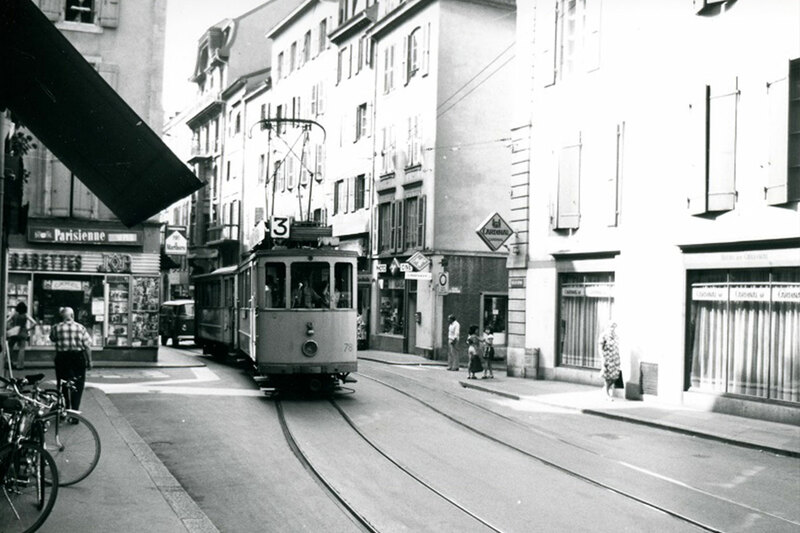 The opposite picture, from unknown origin, show the windows of the Cardinal from Rue du Seyon in 1976. Built within the ground floor of a house built in 1733, Brasserie Le Cardinal is hardly noticeable from the outside. Only the flower motifs etched into the window panes hint at the splendours within. The interior walls are covered with tiles decorated in the purest Art Nouveau style of the Belle Époque (attached picture dating back to 1920’s), depicting fantastical landscapes alive with waterfowl, wild flowers, peacocks, exotic parrots and fairytale castles. The outer façade is considered a piece of architectural heritage. As early as 1905 it was chosen as one of the town’s very first listed buildings and has been carefully cared for ever since. 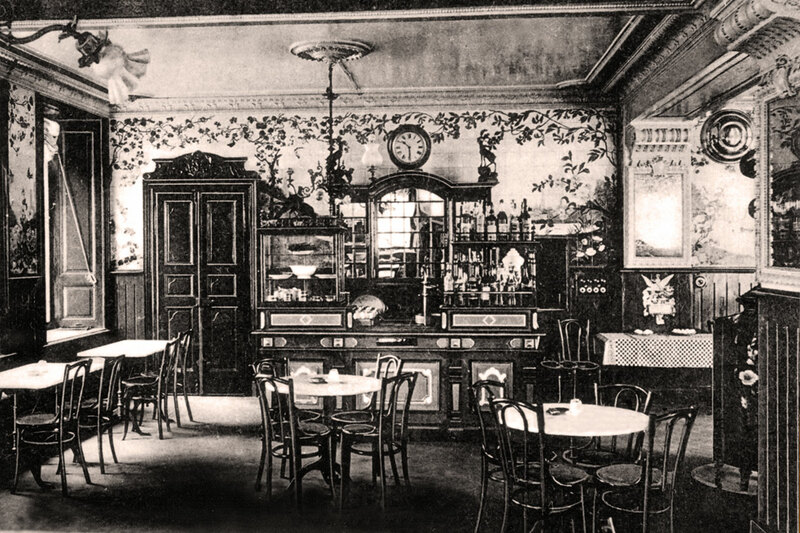 The restaurant’s name dates back to the time when it was owned by the renowned Cardinal brewery of Fribourg, which sold its beer there from 1907 to 1940. The original features are remarkably preserved and the brasserie’s service complements this to reproduce an authentic ambience. Traditional cuisine with “brasserie” specialties is served alongside a lively bar, recreating a warm and friendly atmosphere that is typically Parisian. 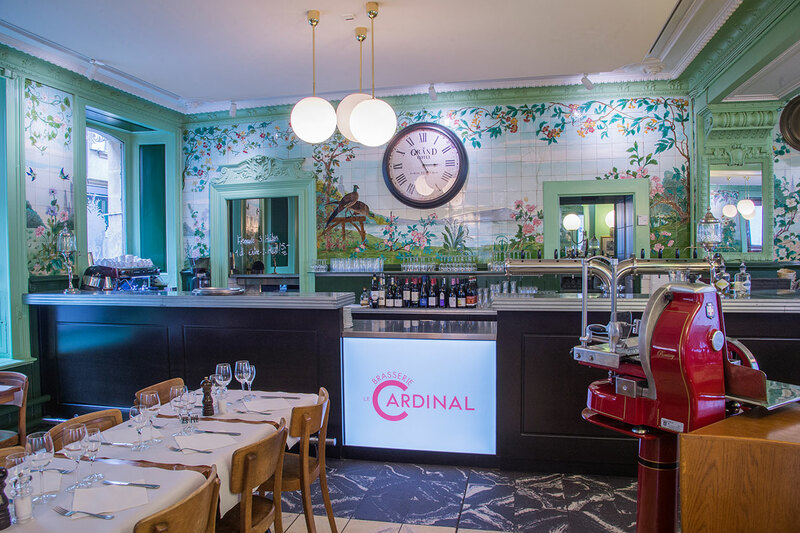 Brasserie Le Cardinal, affectionately referred to by some patrons as “Le Cardoche”, has become an unmissable experience in Neuchâtel. A true institution, this brasserie’s characteristic features are the Art Nouveau interior decoration, which conjures up the spirit of the Belle Époque, and a menu which presents traditional dishes from Parisian brasseries with our own innovative touches and quality local products from France and the surrounding areas. Our regular menu evolves with the changing seasons and includes game in early October during the hunting season. In addition, we offer a special menu and a vegetarian and a pasta dish, all of which change every day to provide constant variety. In winter, an oyster seller runs an oyster and seafood bar just outside the restaurant, giving the place a festive atmosphere and the promise of joyful moments.